Total Area: 1263 Sq. Ft.
Sun room: 203 Sq. Ft. Since its inception, this cottage design has received a lot of attention. It features three bedrooms and one bath, in a very modern looking design. It’s simplicity keeps it cost effective, also proving to be part of it’s charm. The kitchen/living area is a wide open space with a sloped ceiling and a 12 foot high wall full of windows. It was originally designed to face the lake, but could easily take advantage of any views or sunlight your property has to offer. The living area is centered around a wood burning fireplace and is flooded by natural light. Enjoy the fire and the view at the same time, through the huge lakeside windows. The kitchen is laid out very efficiently and features a large eat-in island that adds extra seating and working space. It also features a patio door that walks out onto a deck that connects to the main entryway. This allows for easy access when bringing groceries straight into the kitchen, as well as quick access to the BBQ. The main entry has two sections of coat hooks and benches, as well as a walk -in closet storage room and a main floor laundry, which can also double as extra storage space. The bedrooms are simple and efficient. They don’t waste space with large closets, as most people live out of their suitcase when at the lake. 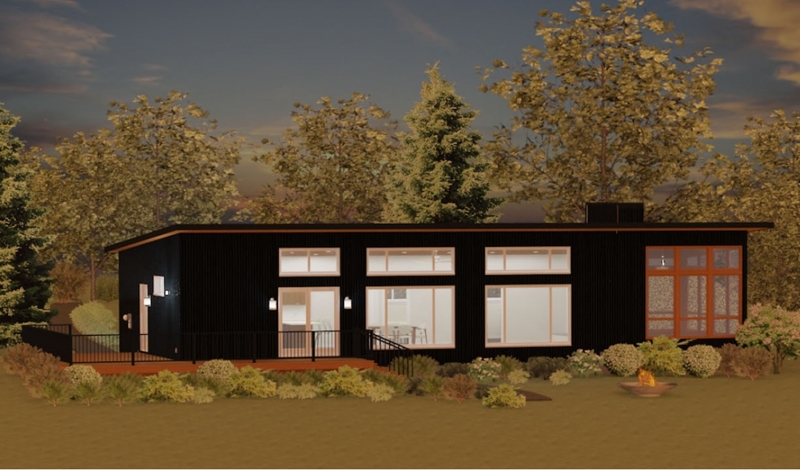 A great option on this design, is to replace the regular bedroom doors with double french doors or double sliding doors, so you can wake up and look straight out the large great room windows onto the lake. The sunroom is another great feature. With three walls of either screen or glass, it allows for maximum natural light as well as maximum airflow on those beautiful summer days. It’s a great space to take in the outdoors, while still staying away from those large cottage country mosquitoes.